The History and Folklore Section of the American Folklore Society announced recipients of the Wayland D. Hand Prize for an outstanding book published between June 2010 and June 2012 that combines historical and folkloristic perspectives. The prize established in 2004 honors the eminent folklorist and historian Wayland D. Hand (1907-1986), who in his teaching and scholarship encouraged historical methodology in folklore research. Jack Zipes, The Irresistible Fairy Tale: The Cultural and Social History of a Genre. Princeton and Oxford: Princeton University Press, 2012. 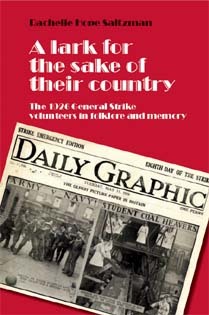 Rachelle Hope Saltzman, A Lark for the Sake of Their Country: The 1926 General Strike Volunteers in Folklore and Memory. Manchester and New York: Manchester University Press, 2012. Rachelle Hope Saltzman draws an array of important ramifications for the understanding of British identity, collective memory, and cultural formation from a specific event—the 1926 General Strike from May 3 to May 12 called by the council of the Trades Union Congress in an unsuccessful attempt to force the British government to prevent wage reduction and improve working conditions for coal miners. She finds significance in folk cultural displays—including pranks, dress, festivity, and jokes– of over half a million registered volunteers in support of the strikers. Judges found convincing her use of this evidence as central features of the rising group’s communication and creation of symbols that would have a lasting effect on British self-consciousness. Also praiseworthy in the judges’ view is the author’s integration of multiple methodologies including oral history, ethnographic analysis, rhetorical criticism, and social evaluation to offer a cohesive and persuasive argument for the symbol-building functions of historical events that groups embrace to achieve a cooperative society out of conflict. The next Wayland Hand Prize competition is scheduled for July 2014. Category: Cultural Studies, Politics	14 Comments.